Without question GPS has revolutionized precise positioning since its advent about 20 years ago. Real-time methods to quickly fix carrier phase integer ambiguities — the key to precision — have been developed and are often referred to as RTK (“real-time kinematic”) techniques. RTK is an advanced manifestation of the principle of differential positioning, a method that requires at least one reference station with known coordinates to simultaneously track GNSS satellite signals. Carrier phase measurements are used in addition to pseudoranges due to their superior accuracy. Nevertheless, ambiguity resolution is only possible as long as the user (the “roving receiver”) is located in the vicinity of this reference station — let us say, within a radius of approximately 10 kilometers. Within this short range the benefits of the often-employed “double differences” technique can be effectively exploited: Differences of observations between a primary and a secondary satellite are formed on both the rover and the reference site and these two quantities are then subtracted, yielding a derived measurement between both sites that is free of satellite and receiver clock offsets or errors. Fortunately, the atmospheric errors are spatially correlated and can be reduced in the double difference measurements to a reasonable extent. Thus, it is relatively easy to fix ambiguities of short baselines, whereas it becomes increasingly difficult to do so over longer baselines due to decorrelation of the atmospheric delays. As a result of this decorrelation, the service area of conventional RTK systems allowing for quick ambiguity fixing covers about 300 square kilometers. To provide service in an area the size of the contiguous United States (9,800,000 square kilometers) would require more than 30,000 reference stations. Even for a country as small as Germany (357,000 square kilometers) more than 1,100 reference sites would still be needed to provide complete coverage — an enormous challenge in terms of infrastructure installation, operations, and maintenance costs. The solution for this problem: Use multiple reference stations to derive atmospheric corrections. Because the coordinates of these fixed stations can be determined precisely — or can be treated as tight constraints — the atmospheric (ionospheric and tropospheric) effects on GNSS signal propagation can be derived from the correlated data. These station-, baseline-, or satellite-specific corrections can be interpolated at the rover site. Hence, atmospheric errors can be significantly reduced and GNSS reference networks can substantially increase the distance between stations while still providing the accuracy level on conventional RTK systems. The reference networks that provide such correction data are often called “active GNSS networks,” referring to their continuous operation. Most of them offer both real-time and post-processing services. 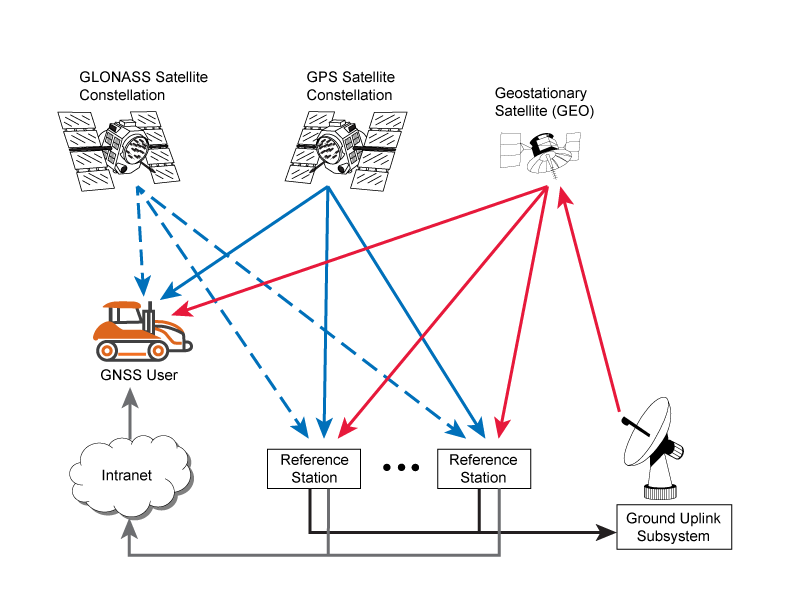 By adding to the number of satellite signals available to these networks, users on the road/in the field can improve their performance by allowing optimization of satellite geometry (the selection of a subset of available signals that reduces the dilution of precision (DOP) factor), use of multiple frequencies for carrier phase integer ambiguity resolution, and for achieving so-called “overdetermined solutions.” With multiple GNSS systems under development in addition to GPS that are increasingly compatible or even interoperable, this prospective approach is becoming ever more attractive. This article outlines the added value from combined GPS+Galileo data processing — rather than GPS-only data processing — in the framework of active GNSS network positioning. In particular, we will look at how such an approach can improve performance in the presence of traveling ionospheric disturbances that produce marked increases or decreases of signal propagation delays.